One & Done or More to Come? “Never judge a Quarterback off of his first year,” is a great quote to live by. Ever since I was told that I’ve started to evaluate quarterbacks differently. Instead of judging them off of their first year I give them a three year process. The three year mark is a long enough frame because various things come into play within those three years. In the very first year, a quarterback will often struggle with the pace, flow of the game. They don’t know their teammates as well which could lead to a few chemistry issues. 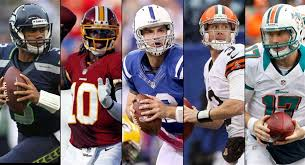 Another problem is that most quarterbacks drafted high in the draft go to bad teams. Due to lack of experience, how are they supposed to be successful right off the bat? And even with those problems, opposing defenses don’t know to fully prepare for them, thus giving them a slight edge. There has been cases where they fail in their first year and there have been cases where they succeed in their first year. One sample is never enough. In year two, defenses are better prepared for the quarterback. They watch film, tapes and a lot of other useful tactics that help in their approach towards stopping them. Quarterbacks struggle and history shows that quarterbacks or any position, for that matter, struggle in the second year. That’s just how it goes. Year three is when the player finally comes into their own. They’ve matured. They’ve gained experience. And they’ve seen a variety of defensive looks. Case in point, they’re more comfortable with their surroundings, coaches, players etc. Whatever the case may be year three is when you find out if you have a stud or if you have a dud. This evaluation can work for every quarterback, outside of Robert Griffin lll. Coming in as a rookie RG3 was arguably the best QB in his draft class. He had a tremendous arm, was very dead on when throwing the deep ball and had Olympic level speed. He was a tremendous athlete whose only downfall was not being able to slide at the appropriate times when facing pressure. Nevertheless during his rookie season Griffin dominated the league. He was one of the highest rated passers. His completion total was decent and he had nice TD-INT ratio. In a week 17 showdown against the Dallas Cowboys Griffin outshined Tony Romo in a game that had playoff implications. 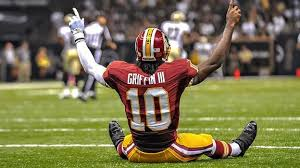 RG3 even had a 14pt lead against the Seattle Seahawks in the playoffs following the win against the Cowboys before he got injured. Unlike year one, year two wasn’t nearly as good. Problems brew in the locker room between players and coaches; Griffin was injury riddled; the whole Redskins organization was in a flux. At the end of the season Mike Shanahan was fired and the Redskins moved in a different direction. 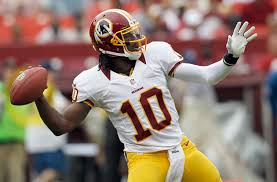 To top it all off RG3 was injured yet again sending his mobility and health into a state of question. That offseason the Redskins filled a couple of holes. They went and signed Jay Gruden as head coach, brought in safety Ryan Clark (Steelers) and defensive lineman Jason Hatcher (Cowboys) to shore up the defense and even stole wide-receiver DeSean Jackson away from the Eagles. They looked prime for a renaissance if RG3 was healthy and in tip top form. Last season, RG3’s third year, ended up being a mess as well. He missed bits and pieces of Training Camp/pre-season action and wasn’t fully ready to go week one of the season. Need playbook, new coach and having a new target all added onto his struggles. At one point he even lost the trust of a few teammates. Last season wasn’t even about football for him. It was more about him finding common ground with his new coach and his teammates, as well as regaining his health the thing that he ultimately failed to do. So don’t doubt RG3 just yet. There is still some time left for him. 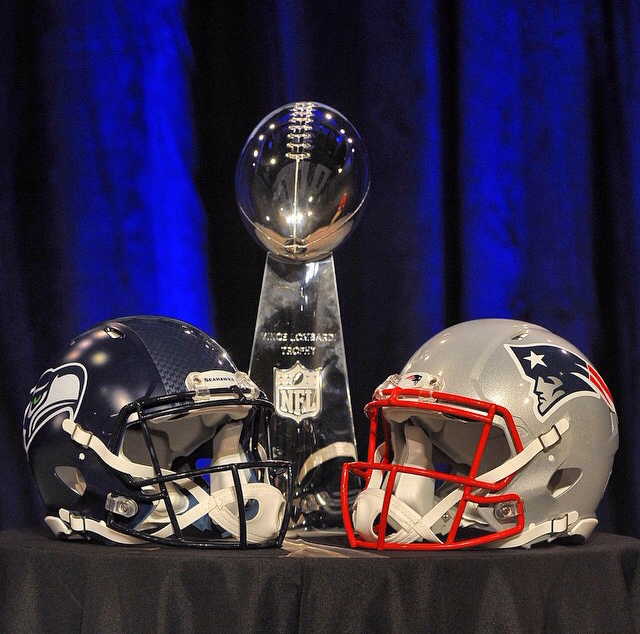 This past Super Bowl game highlighted the Seattle Seahawks and the New England Patriots. Tom Brady versus “The Legion of Boom”. This game was a legacy game for Brady; for all of those that doubted him and for all of those who believed him to be a cheater after the recent AFC Championship Game. With the entire nation watching, Brady struggled early on in the first half but by the 4th quarter he had turned it on by picking apart the #1 defense of the past 3 years. With an amazing drive down the field that ended with a touchdown to Julian Edleman; the Patriots had taken a 4 point lead. The Seahawks had the ball with roughly two minutes remaining. I honestly can’t remember that much of the drive as I try to recollect what happened. I know I see Russell Wilson chunk the ball down the right sideline, trying to test Malcolm Butler down the field and make something happen. Then with Malcolm Butler playing tremendous defense, somehow someway Jermaine Kearse hits the ground, kicks the ball to himself, then it bounces off of both hands and then makes the catch. I officially believed the game was over and that the football gods would never allow Brady that final ring. The next play Marshawn Lynch gets an easy run all the way to the goal line and it seemed to all be over. 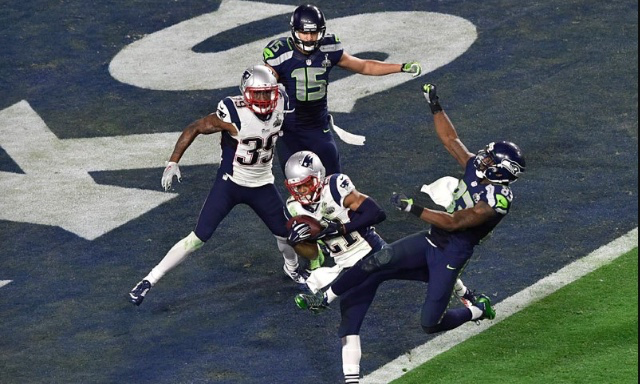 Then some kid named Malcolm Butler, who just let potentially the game winning catch happen on his watch, jumps the slant route at the goal line and the rest is history. The question now is, who is the greatest quarterback to ever play? In most NFL fans’ eyes the top two are Joe Montana and Tom Brady. If you’ve read my article ranking the top 15 QBs of all time, I had Joe Montana at #1. I also claimed that if Brady could get the 4th ring that had eluded him for so long, that the debate for greatest of all time could become legitimate. I would like to start off saying I do not care about somebody being undefeated in any championship format. Montana being 4 for 4 or Brady being 4 for 6 does not matter to me at all. If anything, I find it more impressive that Brady was able to make many deep playoff runs. Actually lets start off with this. Montana played 15 years and Brady up to this point has played in the NFL also for 15 years. 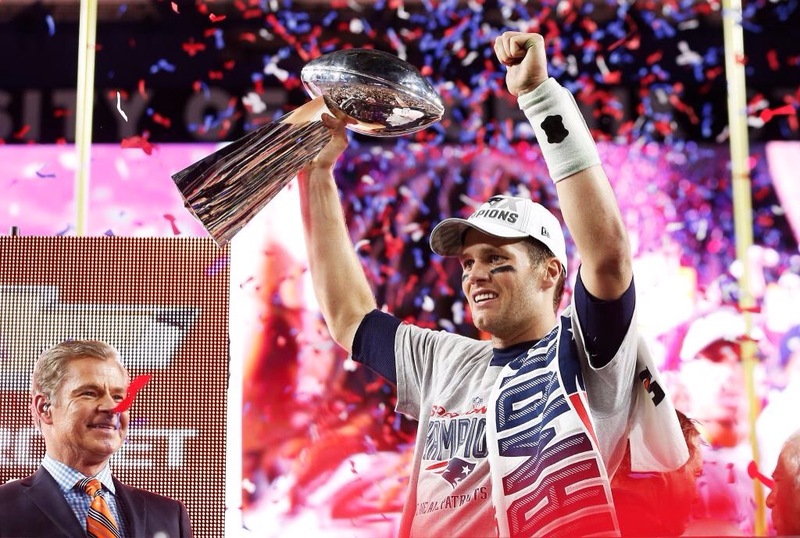 (Even though technically Brady wasn’t given a chance as a starter until his second season.) Montana has 4 one and done’s. Which means he went to the playoffs four times without winning a single game. In those 4 games, Montana had 817 yards (roughly 204 yards a game), 2 touchdowns, and 6 interceptions. The reason I bring up these stats is to show that these games lost can be put on Montana’s shoulders by not throwing a single touchdown in 3 of the 4 games. Brady has 2 one and done’s. In those two games he threw for 4 touchdowns and 4 interceptions. Again blame can be put on the shoulders of the quarterback in this situation because you’re not helping your team if your TD:INT is 1:1. 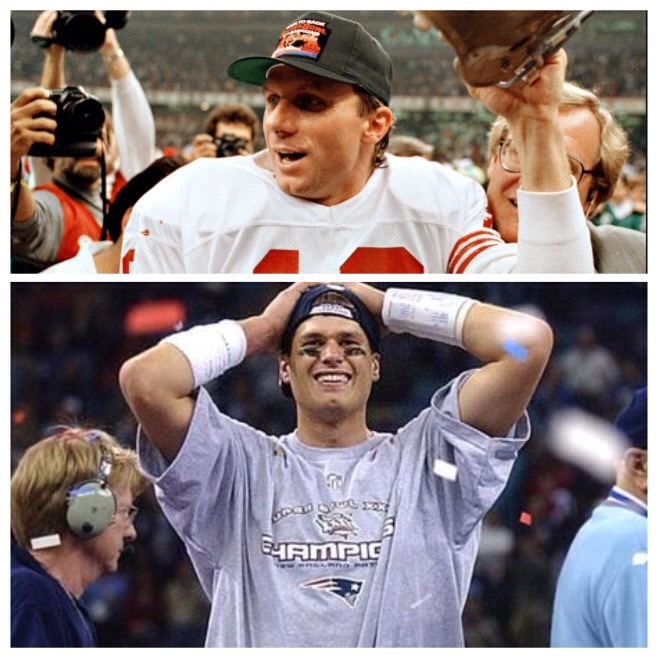 Joe Montana in 1989 cultivated the greatest post season run that has only been matched by one player since. In that ’89 run, Montana threw 78% for 11 touchdowns and ZERO interceptions. The most touchdowns in a post season for Brady happen in this past playoffs in which he threw 10 touchdowns to 4 interceptions. Montana is 16-7 in the playoffs compared to Brady’s 21-8. Now to the regular season comparisons. Montana has six 10+ win seasons. Brady has double the amount with twelve 10+ win seasons. The one year Brady didn’t have 10 wins, he went 9-7. Brady brought together one of the greatest offenses of all time in 2007 when he threw for 50 touchdowns with 8 interceptions, doing so with Randy Moss and Wes Welker. Montana had one season with 30+ touchdowns compared to Brady’s five 30+ touchdown seasons. It’s good to note that in Montana’s sole 30+ touchdown season with 31 total TD’s; Jerry Rice had 22 touchdowns that season making up for 70% of Montana’s touchdowns that season, and Rice consistently made up for about 50% of Montana’s touchdowns every year he was there. Brady’s best year with 50 touchdowns, Randy Moss accumulated 23 touchdowns making up only 46% of his touchdowns. Brady led a team to only the 2nd ever perfect record in a regular season going 16-0. Another thing to note about each quarterback. Brady’s team went 11-5 with him out for an entire season when Brady went out in the very first game of the season. Montana went down and was replaced with young prospect Steve Young who went on to win a Super Bowl without Montana being in the picture. In this argument though I have to give it to Montana because the 49ers got really lucky finding Steve Young who could be argued as the most efficient quarterback ever. Now the surrounding cast. Montana had Jerry Rice, who by many is seen as the greatest football player to ever play, John Taylor who was a legitimate threat opposite of Rice, and Roger Craig who was a threat from running and receiving recording over 1,100 yards from scrimmage in 7 straight seasons. Brady has had Julian Edleman, who was huge in this past Super Bowl and was named to the all pro team, Randy Moss who I believe and many others believe to be the second greatest receiver ever, Wes Welker who I do believe was good but I can’t help the fact that he became a 3rd or 4th option when he went to Denver, and Gronkowski who I believe if he can stay away from injuries, will go down as the greatest tight end of all time. All of the weapons I named for Brady came after his initial 3 rings. Montana didn’t have most of the weapons I listed for his first 2 rings but also had arguably the greatest defensive player to fall back on with Ronnie Lott and an overall loaded defense. Not to say that Brady didn’t have his own defense to fall back on, as they were the firepower of those first 3 championships. Both quarterbacks had great coaches and are even in that aspect. One of the biggest arguments to look at when comparing the two is the fact that there was no salary cap back then. The San Francisco 49ers, the Dallas Cowboys, and a few others were loaded with money to pay guys. Throughout Brady’s whole career a salary cap has been put in place. Brady makes it easier on himself a bit by constantly taking pay cuts to sign other guys, but the Patriots are not able to go out and get the top free agent every off-season. All around Montana just had a lot more help. Brady hasn’t had any of his weapons besides Gronk who has been riddled with injuries most of his career, and Welker for more than 3 years. In conclusion I see the arguments both ways. If you say anything different than me, I’m not going to say you’re wrong; I’ll just give the facts as I see them, but Brady has a slight edge in every aspect. I can’t shake the fact that the one and only time he had a top 10 receiver he almost went 19-0 and threw for 50 touchdowns. He could have 6 rings right now if not for Mario Manningham making one crazy catch, and Eli throwing into double coverage after the pocket broke down to some guy named David Tyree who caught the ball on his helmet making arguably the greatest catch of all time. You can argue that Montana in his Super Bowl appearances never let the game be close enough for that to happen, but he also didn’t face the teams Brady did. Brady beat the “Greatest Show on Turf”; which is still recognized as the BEST offense of all time; the Eagles lead by Donavan McNabb, Terrell Owens, and Andy Reid; plus this last Super Bowl where Brady beat the Legion of Boom who beat down statistically the greatest offense ever two Super Bowls ago 43-8. Brady has done as much if not more depending on how you look at it, with less than Montana had. The greatest quarterback to ever live is out on the field and is looking to extend that legacy even further. Tom Brady is the greatest of all time. No Ware, no Austin, no Lee, no Hatcher, no Ratliff and no sign of improvement. Looking at the schedule the Cowboys would be lucky to win six games in most eyes, while others will settle down and say they’ll make it to eight wins. The schedule is hard. Romo is one major hit from being out and the defense is still disgraceful. Despite all of that there is still a reason to believe. Am I saying they could make a run a the Superbowl, HELL NO. But what I am saying is that they could at least be formidable. Here in the offseason the Cowboys did a few good things. By bulking up the O-line the Cowboys have assured three to four things. 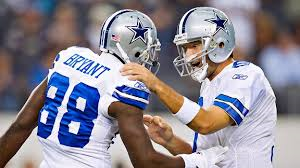 Romo will be protected, he’ll be more accurate, they’ll run the ball more and the offense will be much better. New play caller Scott Linehan will help the offense a lot more as well and expand the games of many players as well as the dynamic of the playbook which was often viewed as too simplistic. With Linehan on board the Cowboys will be able to utilize Dez Bryant, Escobar and Dunbar in ways that weren’t apprehendable before. Dez will be moving/lining up all over the place in ways that Calvin Johnson did. Dunbar will be used in screen plays like Reggie Bush and Escobar will become a big redzone threat. 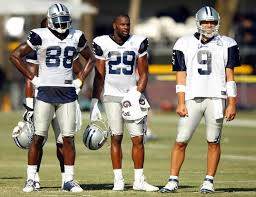 Williams will only improve and Witten will still be there in bail out time. The O-line now has three First Rd. picks on board and should be to protect Romo and create holes for Murray. Most believe this O-line will blossom into a top three or five group which could create a lot of problems for opposing defenses. There have also been a lot of talk and hype from the Cowboys camp as well. Romo has been saying he’s better than ever and that his best years are in front of him. Dez has been talking about how high of ceiling he has and how he’s ready to take the next step. Murray also said he’s ready to carry the load. Even Jerry Jones came out and talked about how confident he is in this offense. All of the talk has to equate to something right? After glossing over the offense and how there’s hype surrounding it I forgot to mention cornerback Brandon Carr and the comments he made during the off-season. Carr came out and said it’s basically time for him to come out and dominate the league. Let that sink for a second… Dominate the league he says. DOMINTAE THE LEAGUE. The same guy who allowed Calvin Johnson to break a single game record and who got burnt by damn near every receiver has the audacity to come out and say it’s time for him to dominate the league, wow. Just wow. But in all honesty I can’t blame him for those comments. Carr needs to dominate every receiver that steps opposite of him if the Cowboys want to improve defensively. Carr needs to become one of, if not the vocal leader of the Cowboy’s defensive unit now that Ware is gone and Sean Lee is out for the season. (Tragic I know.) The Cowboys are paying Carr like a top notch and corner it’s now time that he plays like it. Same could be said for Morris Claiborne as well; its now time for him to play to his potential and stay healthy as well. J.J. Wilcox is another guy in the secondary who should have an impact as well. Last season personal issues and injuries kept him from being consistently good. If those three guys along with Scandrick and Church perform like we know they can the secondary could be a strong point. As far as the linebacker and D-line go the Cowboys have way too many question marks. They could be a better group than last season but who knows. Rookie DE, Demarcus Lawrence, is already out for a portion of the season; former Pro Bowl DT, Henry Melton, is just coming back from injury; Anthony Spencer is still a huge IF and Amobi Okoye is still too far off gauge where he’s at. With that being said the only sure thing on the D-line is George Selvie who led the team in sacks this past season. Sure, the Cowboys have a lot of other defensive line on board but none of them are guaranteed to have the same impact on the game as some of the guys mentioned above would. Nevertheless, the D-Line could prove to be a strong point as the season progresses but as of now its deemed as putrid. Last but not least, well maybe least, we have the linebacker core. When Sean Lee went down so did this group. Guys like Bruce Carter and Justin Durant just aren’t consistent enough to be viewed as good or respectable. This is just a sorry group of linebackers point blank period. But there could be a bright spot. Twice retired linebacker Rolando McClain could prove to be a huge pickup. He was star a few years back in college with Alabama and was still nice upon joining the league as a top pick. He has tremendous upside and could help this defense significantly. ( Might be a nice guy to pair Lee with in the future as well.) Having hit rock bottom last year as a defense, the Cowboys can only improve. It may not be much better, but an improvement is still positive and could bold well. Why do I feel so strongly about the Cowboys? This is why. Went 5-1 in division play with Romo missing the sole game they lost. Eight and eight with the worst defense in NFL history and the Cowboys still managed to own their division. Incredible. Why can’t they replicate that again this year with a more dynamic offense and slightly improved defense? After bottoming out at a league low defensively I don’t see any reason on why the Cowboys can’t improve on that end. . If the defense can stay healthy, be resilient, show toughness and play with an edge they could be formidable. Improving the O-line and changing play callers plus expanding the playbook can only enhance the offense and make them more dynamic. If the offense can stick to the run and Murray does his job the Cowboys could very be put in position to scare a few people. It’s just a matter of going out and doing it. The Cowboys have the guys and enough of the power to do so. However the real question is, do they have the mindset or the will to do it? Time and time again they showed us they didn’t but maybe things have changed this time around.